Elizabeth & Co.: Why my garage has no furniture! Why my garage has no furniture! I have exactly one piece of furniture in my garage right now. And that's kind of a good thing because I really do like parking my car in the garage. But I really like painting furniture more. And even though we just wrapped up our spring tag sale, I know that our summer sale will be here before you know it. So I need furniture! There was a time when my side of the garage was full of furniture. I had a nice little routine going. I would go to the gym a few mornings a week, then I would swing by the Goodwill on my way home. I could pretty much count on a good find at least once week. Now I rarely even stop at the Goodwill. The reason - a dramatic rise in prices. But yesterday I was out meeting a client and thought maybe I'd give the Goodwill another try. But it was the same story I've been finding for the last few months. Case in point - adorable dresser, right? It has a few veneer issues and the drawers need a little work, but nothing I haven't dealt with before. I should be doing the happy dance, right? But here's my problem. Yes people, that is a $300 dresser at the Goodwill! We don't even sell dressers at our tag sales for $300 AFTER we work on them. ... Now please tell me, is this happening everywhere? ... My theory is that it's not just a reflection of the economy, but that thrift shopping has become quite trendy. That is a good thing for our tag sales, but it makes finding good pieces at reasonable prices more difficult. ... I'd love to hear your thoughts! I'll be honest, going to the Goodwill was just so darn easy. Yard sales and auctions are not my favorite things, but I maybe I need to learn to love them. Craigslist is not all that great in our area and there are not a whole lot of thrift stores or flea markets. ... So let me know, where are the best furniture finds in your area? Now let me tell you about Karla's garage. You saw it here a few months ago. Remember all the chairs? Well, Karla had slowly worked it down to almost nothing ... until her husband went to a barn sale and brought her four truck loads of new stuff!!! Yes, it's all filled up again! I love this little blue enamel top cabinet. It has the cutest door that just needs to be reattached. With a little love, it will be adorable! I told Karla that is was meant to be blue, no painting it a "neutral" color. And just look at this old workbench that Karla found a spot for in her garden. There is another one just like it in the garage under all that stuff! Hmmm, I'm pondering! And this is the stuff they decided not to keep. It was headed for the dump, but I intercepted it just in the nick of time! And a few other pieces somehow found their way into my vehicle. So now that one dresser won't feel quite so lonely in my garage. But I still need furniture!!! I guess we're all just one barn sale away from a whole garage full of furniture! I'm in Ontario, Canada and I agree about the much higher Goodwill and Salvation Army furniture prices. I have seen lots of dressers needing work for $200+ and little single night tables really really needing attention for over $30. Kijiji, Craigs and yard sales are the best spots around here, but I would love to find a truckload. Lucky Karla! Ugh! Goodwill in my area has ALWAYS been over priced. I have actually never purchased a piece of furniture there. I often want to ask who does their pricing when I'm in there, but don't have the guts. They will have $1 items from the dollar bins at Target, and they charge $.99. It makes me so mad! I barely ever go there and we are seriously lacking other thrift shops around here :( Bummer! We have a new goodwill in town (less than a year old) and YES always such high prices, I just don't understand, not in great shape either? what gives? I totally agree!! I actually get really angry when I go to the Goodwill. What's up with that??!!! I've seen Dollar Store items listed for $1.25 and more - are they for real??? Just means more yard sales for me I guess!! Lafayette, IN here with 3 Good wills that have also gotten ridiculously over priced in the last year or so. I'm also irritated and want yo know who is pricing the stuff. Most of the time i wouldn't pay half of what they are asking. They're not going to do much good for others if we all stop shopping there. Same exact story here in Niceville, FL...insanely high prices at Goodwill. I pretty much stopped even looking. Every now and then if I have a bit of extra time I will go in and then it takes me about 2 seconds to remember why I don't go there. I couldn't even afford to buy anything there for my own house; let alone for resale. Thrift store prices have been that way here for quite a while. I rarely make good find. Same thing, they charge what I would plan to ask latter the fact. I do have a little more luck on pieces from the 1970s and later. Auctions are the best source for me. Good luck with your finding! Same here in Missouri. Have noticed prices creeping up. Garage sales are the better bet but then gas costs are a problem so I stay close to my house. Glad it is garage sale season again. Good luck something always comes along. Where are these barn sales? I need one! I do alright scouring CL, thrift stores and yard sales but it is a full time job! I would love three truckloads of stuff from the inside of an old barn! i definitely think that the goodwills have caught onto the thrifting trend. ours luckily is new and the prices are decent for the most part..... for now!!! and WOW i need a barn saling husband! Is the same here in VA, our GW and TS' s prices have increased incredibly. 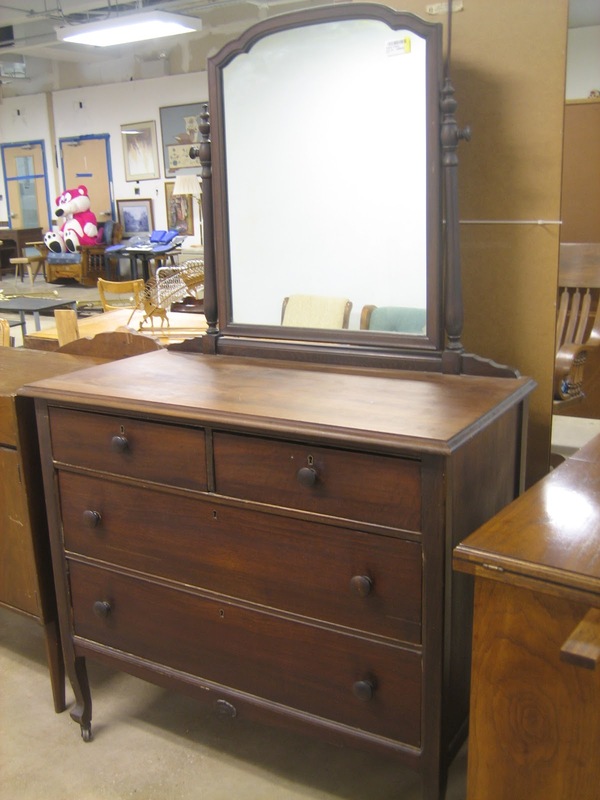 Chests and dressers as well are over $ 300. Many times I have to stop and look 2 times to be sure if I enter in an antique store instead of a GW. Holy cow! 4 truck loads!? Such cool stuff. I'm with you, Goodwill is overpricing their items. I go to one by my house every week and the same furniture is still sitting there because it's overpriced. Some things aren't too bad, but for the most part, they have raised prices and it seems to be hurting their sales. Whoa, four truckloads... and still was going to take a whole load to the dump--so glad you intercepted! $300.00 is crazy. The Goodwill that I go to in Central Fla is very well priced. So is the salvation Army (but when it comes to furniture, our Goodwill has the best prices.) I found a vintage pair of wooden end tables by Lane - $8.00 total. They are painted a horrible shade of brown that I'm currently working on stripping off. Yup, same thing here in Boise; sky high prices everywhere. But, honestly, my jaw dropped at the dresser priced for $300. That's just craziness. May the furniture fairies grace you with your very own barn sale. I don't really go to Goodwill here because it's tiny, the people are rude, and the musty smell is overwhelming (i always have breathing issues for a day or two after going in there), but the prices at the Habitat for Humanity Re-store are pretty high. I usually go stuff hunting there every other week. They do have a clearance section though, and stuff that rotates through there is fairly reasonable...we got a $15 table earlier this month. It totally depends on the GW around here, but the highest price I've ever seen at my fave GW is $120 and that was for a huge piece. I cannot believe they want $300 for that. I am finding garage sales the way to go...unfortunately, it's seasonal in MN. I've seen my GW go up in prices, but $300 is really wild! I rarely find something there, but when I do it is a really good deal. I need to find me a barn sale! Thanks so much for stopping by today, and for always having fun and fabulous projects to share! I'm so glad I found your site! The Goodwill near my house has raised their prices as well! It absolutely amazes me-- I don't understand if it's a trend thing like you said, or if it's just the economy. Whatever it is, I don't like it! I find my best stuff on Craigslist or at garage sales. I like garage sales because you never know what you're going to get or find! 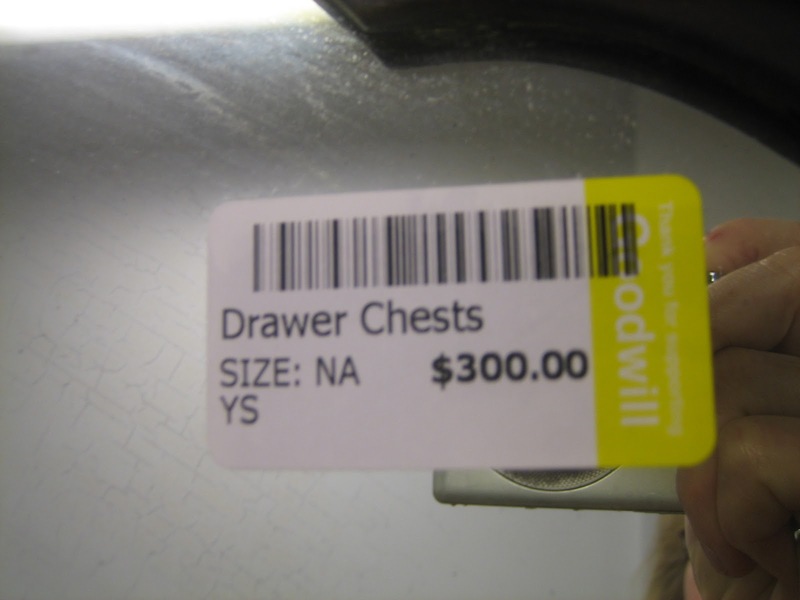 I've noticed that prices keep going up at our thrift stores, too. But then there are other times that there is NO rhyme or reason to how things are priced at all--so sometimes I get lucky ;-) Happy furniture hunting! Hello, I live in Argentina and here's the same with the prices. We do not have garage sales or barn, but if there are certain places for the sale of artidulos used with good prices . Call chatarreros. Yes Goodwill is very expensive! And other thrift stores same story! Is really difficult to find good stuff and good prices, each time worser if you live in a city the resources are few and high in prices! Good luck on your finds! I live in Vancouver BC Canada. I just started painting furniture and have the same problem, although I don't know how it was before... hehe! But here the prices are quite expensive. Salv. Army has crappy stuff and expensive. Craigslist is where I get most of my stuff, I need to search a lot to buy a dresser for $50, $80 sometimes $100. I have been to a few garage sales but nothing really nice and cheap. So I guess Craigslist is still my best bet. I live in Brisbane Australia and have to agree that op shop prices have gone crazy. Its because they are now trendy.. Unfortunately they have taken away a lot of the thrill of finding a bargain and giving it a new life. Sometimes though if you go to the not so popular suburbs you can pick up a great find. The great thing about something used is it has history and character and sometimes you just have to have it. Even if it does cost a bit more and you know that it is going to a good cause. I love the dresser....but I also know what you mean...furniture in goodwill stores are expensive in Melbourne as well....hard to believe since it's a goodwill/charity store and almost all furniture has been donated to them. I agree, Sharon! I was floored with the prices I saw at the Goodwill in our area. I have found much better deals on CL. Karla's garage looks like a goldmine. :) I can't wait to see what you do with that dresser. I know for the next tag sale to come early because you all have amazing stuff!! I have never bought furniture at Goodwill because the prices are laughable. I find the smaller mom and pop type thrifts to be more reasonable. WOW! Can't wait to see what you do with everything. I've never had any luck with Goodwill either but the yardsales in my area are usual aces. I needed a dresser, went to Goodwilly, found it, price tag $1,000.00. After my heart calmed down and my mouth shut, I left shaking my head. geez, i think i had better check out our goodwill again. $300? ludicrous! i am all for shopping at goodwill to contribute to the good will...but wowzer! I have a garage that I hires to store car. Now I need space to store furniture. Should I keep them in garage or I should look for other websites for self storage. I'm at Primitive & Proper Today!